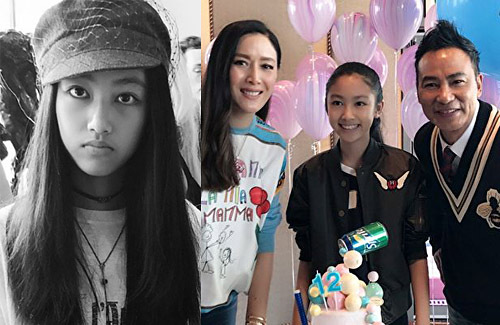 Ella, Ashley, Sham Yuet, and Koki inherited their beautiful looks from their famous parents. Beauty is often inherited from parents. Below are four celebrities with beautiful daughters who acquired their parents’ beauty. Several of these girls have splashed into the modeling scene due to their striking features. Ella Yam (任晴佳) is Simon Yam (任達華) and Qiqi Mao’s (模琦琦) 13-year-old daughter. At such a young age, Ella is already in the modelling business because of her 5-feet-6-inch height. What really makes her stand out are her beautiful 42-inch legs. Qiqi, who was a former model, admits that her daughter has a better body than her. This year, Ella will begin filming for her modelling agency and many fans are excited for her debut. Ashley Lam (林愷鈴) is 80s actress, Mimi Kung’s (龔慈恩) beautiful 18-year-old daughter. Not only does she have the title of “beautiful second generation star,” Ashley is really smart and talented, as she wants to attend Hong Kong University for Architecture. As well, she is very talented in music. She already finished her eighth-level piano exam at the age of 8 and currently, she is signed as an artiste under Johnnie To (杜琪峯). Chingmy Yau (邱淑貞) was known as a goddess during the 80s and 90s. Her eldest daughter, Sham Yuet (沈月), is currently 16 years old and she has inherited her mother’s good looks. Though she may be low profile, many fans think she has goddess potential. Many of Chingmy’s fans hope that they will see Sham Yuet on the big screen soon because she embodies star potential. Japanese power couple Takuya Kimura and Shizua Kudo‘s daughter, Koki, definitely inherited their star genetics. Though she is only 15 years old, Koki already has over 1.3 million followers on Instagram. With her cool vibe and beautiful look, Koki was an instant sensation when she started modeling four months ago. Recently, she appeared on the cover of over 74 news magazines. Her future is definitely bright. Wow Chingmy’s daughter is really beautiful. Sham Yuet? How weird that she uses a Chinese name. I can’t comment on Koki, since I don’t follow Japanese entertainment so no clue who she is or what her parents look like. 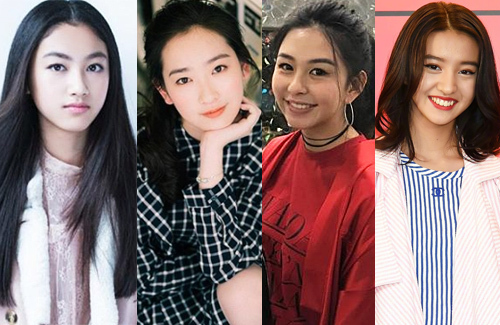 But Ella Yam and Ashley Lin, definitely not surprised that they are beautiful, since both sets of parents are good-looking in their own right. 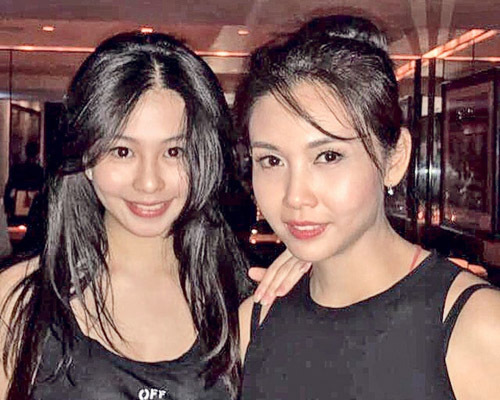 As for Sham Yuet, she definitely inherited her mom’s beauty, which is a good thing considering her dad isn’t good-looking at all….but then again, all 3 of Chingmy’s daughters are beauties like her – her genes must be stronger than her husband Sham Kar Wai’s, lol. @llwy12 oh really? I have not seen the other 2 daughters but this one here is gorgeous and she has a rather unique name. I like her name. Koki definitely inherited dad’s looks. Funny that I have never find Takuya good-looking (compared to Yutaka or Takeshi) when he was young but a female version of him on his daughter seems to have unexpected results. The girl look gorgeous. @nigel Here’s a picture of Chingmy, her husband Sham Kar Wai, and their 3 daughters at Jacky Cheung’s concert earlier this year (this was during Jacky’s Taiwan concert in April when all his close friends got together to attend his concert as a group — despite all the big names in attendance, including the likes of Tony Leung and Carina Lau, the rare appearance of all 3 of Chingmy’s daughters actually got the most attention, lol). @llwy12 oh wow. Thanks for sharing. I think the eldest & the youngest look beautiful. The mid children not as good looking. @nigel Btw, all 3 of her daughters have “unique” names – it’s obvious Chingmy had a “theme” going when naming them, lol. Eldest daughter is named Sham Yuet 沈月 (Chinese character for “moon” or “month”), middle daughter is Sham Yat 沈日(Chinese character for “day” though can also mean “sun” if put together with character for “moon”) , youngest daughter is Sham Sing 沈晨 (Chinese character is actually pronounced ‘San’ in Cantonese, which by itself means “morning” / “daybreak” but they probably use ‘Sing’ because a variation of the ‘san’ character can be combined with the Chinese character ‘sing’ to represent “star”….I know it’s a bit confusing, but those familiar with the Chinese language will probably understand the nuances with the characters…). Chingmy isn’t such a great beauty to me. Her eldest inherited good looks from dad who looks mixed. Don’t think that Japanese girl looks anything special either. To me the prettiest child model today is Ella G. She is super gorgeous at only 10 years old. Ella is the only one who has model potential to me. The rest are fine and good-looking girls, but they don’t really stand out. Maybe in a sea of average faces, they’re beauties, but placed against other models & beauties, they lose their shine. But, they’re still young, so their looks can mature and fill out with time. @coralie Agree with u. Ella is a stunning beauty. The other girls here get the media’s attention becos of their famous parents. If they were nobodies I doubt they will stand out much.